Koto: Jyo Saku: Enkei: Yamashiro. Habaki : silver and gold foiked double Habaki. 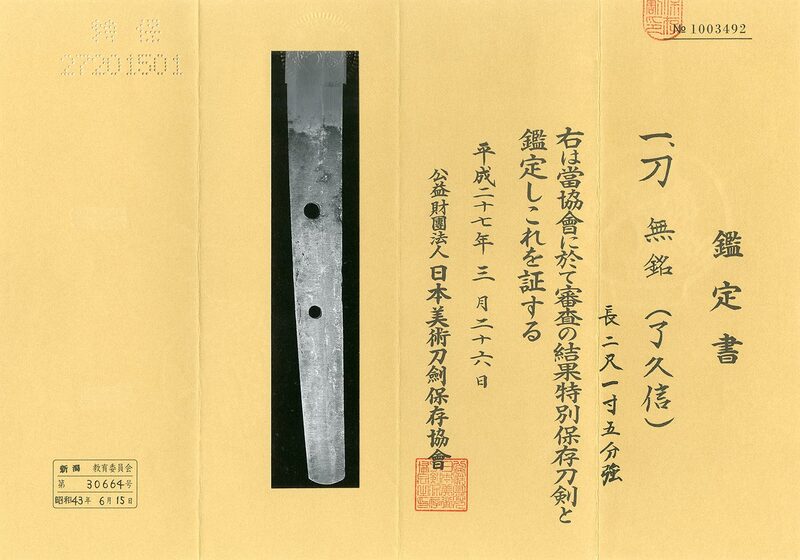 Width at the Kissaki : 1.91 cm or 0.75 inches. Era : Late Kamakura period, around Enkei era 1308. Shape : Osuriage Mumei, regular width and thickness Katana. Jigane : Itame Hada and Ko Mokume Hada with Jinie attach. There are Chikei and Utsuri. Hamon : Ko Nie Deki, Suguha and double Ha. The Ha is bright. In Ha, there are soft Yo. Boshi is round Hakikake style. Special feature: Ryokai Hisanobu was a son of Ryokai. His stlye is same as his father. And also his works look like Rai school's blade. He is descendent from Rai school. Menuki : Large size Menuki , bow is engraved with gold color. From Aoi Art: The Jigane is beautiful. There are Utsuri. The Hamon is Suguha and double Ha. The Jigane is elegant Yamashiro Jigane. The blade was made more than 700 years ago. The Koshirae is also nice.